Michael “Shane” LeCroy, being named fire chief for the City of Terrell is the culmination of a career dream. A Terrell native, LeCroy began his firefighting career as a member of the Terrell Volunteer Fire Department, a position he held from 1987 until 2012. LeCroy, who served as a volunteer with some of Terrell’s previous fire chiefs, said he is excited about serving as the fire chief in his hometown. “Terrell has always been the no. 1 prospect for me,” he said. LeCroy comes to Terrell with a wealth of educational training and more than 30 years of experience on the fire service. In 1988, LeCroy began his paid career with the University Park Fire Department. Upon joining University Park, he was sent to Arlington Fire Department Fire Academy, where he became the academy’s first graduate. He then went on to attend Paramedic School at UT Southwestern. Throughout his tenure at University Park, LeCroy climbed the ranks, from driver, to captain, to Assistant Chief, a position he held for 10 years. LeCroy is joining the City of Terrell during the midst of unprecedented growth, a challenge he readily accepts. “The city is growing and needs the department to grow with it,” LeCroy said. LeCroys said is looking forward to the opportunity to serve his community. The city’s newest face said he intends to move the department forward by continuing to seek out grant opportunities and cooperative efforts with local volunteers. “I have a lot of respect for volunteers,” LeCroy said, adding that volunteers are normally employed with paid departments who bring a lot of experience to the table. “I am fully convinced that my experience as a volunteer contributed to my promotional success at University Park,” LeCroy said, adding that he had a working fire the first five days he served as a volunteer. When LeCroy is not working, he enjoys spending time with his family. He and his wife Mindy have two grown children, Shane LeCroy Jr., who is a firefighter in Rowlett and a daughter Brandy Voge. He also has four grandchildren, Hudson and Jacks LeCroy and Landon and Cheyenne Voge. LeCroy said he also enjoys hunting and has recently taken up golf. 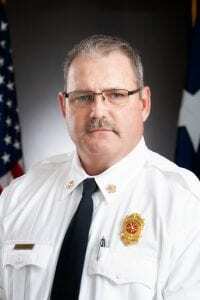 LeCroy holds an Associate’s degree in Applied Science from Trinity Valley Community College and a Bachelor of Applied Arts and Science degree in Emergency Management Administration from West Texas A & M. In addition, LeCroy holds multiple Texas Commission on Fire Protection certifications.